iTunes. You know it. I know it. We all have some sort of a relationship with it, whether it’s love for the things it does or hate for how bloated it has become. So what happens when you send a link to a song or album from the iTunes Store to somebody who doesn’t have or even want iTunes? Well, the person used to be whisked away to a magical page that would kindly implore him or her to install this wonderful, free software called (yes) iTunes. That makes your hypothetical iTunes-hating buddy unhappy. Apple has quietly launched iTunes Preview, a feature that shows what music is available on iTunes from the convenience of your Web browser. Yes, even Internet Explorer 6. iTunes Preview lets anyone browse through the entire iTunes catalog’s worth of music, info, and user reviews for any region. You can access iTunes Preview in one of two ways, either through iTunes Charts on Apple’s Website or automatically through any link generated from the iTunes Store’s Copy Link feature. 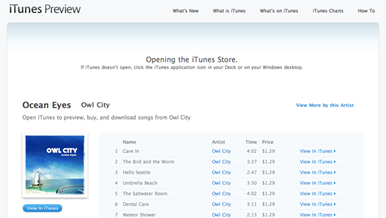 Unfortunately, it’s still not possible to listen to previews outside of iTunes. That makes iTunes Preview’s name a bit of a misnomer, but it’s certainly more marketable than, say, iTunes Tease. Just in case you forget, there’s a giant ad on top of the page to remind you that you must install iTunes to sample and purchase this music. For now, this feature only works with music, but it’s easy to see how this may someday be extended to movies, TV shows, and the App Store.